PCE Dragon Egg! (JPN) in 07:36.27 by adelikat. Well now, TASVideos does have them! 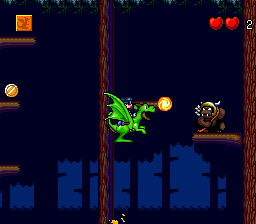 In Dragon Egg, the heroine carries around a portable dragon which, after many power-ups, becomes a lot less portable to the point where the heroine is portable instead. The author uses the game's quirky physics to move faster and create some interesting shortcuts that are normally not possible during real-time play.